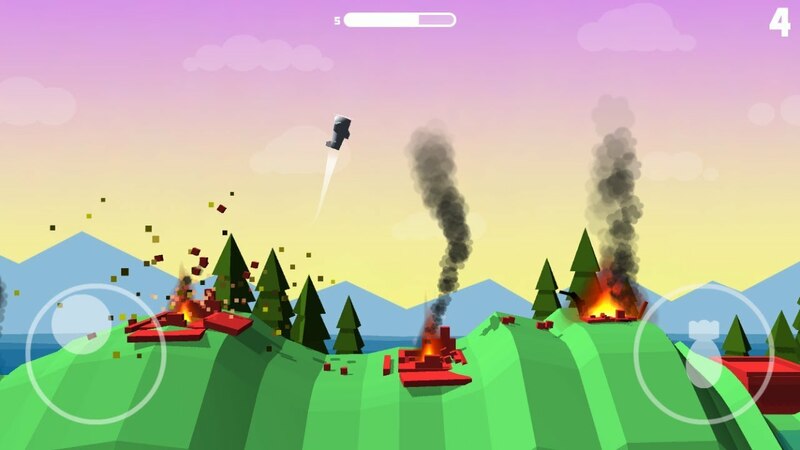 Bomber Ace is a very addictive game for Android from the studio Madfatcat games, in which we will manage the bombers. The game received an ascetic design and minimalist graphic design, but at the sametime it will please us with high-quality animation and very interesting physics. The sound was modest, but the gameplay does not suffer from this. The meaning of the gameplay is to have to bomb the enemy military bases. Usually, the locations are not so big and you don’t have to fly far, and in cases where the enemy has settled in a larger area, you first need to deal with the first buildings. Only then we are allowed on. Since we will be driving a bomber, nothing remains but to dump the blanks. But we will be fired at by machine gunners and anti-aircraft installations. In the first levels, all the buildings are located on the plains and the only thing that is required of us is to aim well, calculate the lead time and drop the bomb in time. And you can bomb not only buildings, anti-aircraft or rocket launchers, but also people who fly over the horizon with a screech. Over time, the landscape of locations begins to transform into mountainous terrain and buildings destined for destruction begin to hide in the gorges. To hit them in such cases is obtained only if you go into a steep dive from top to bottom. The main thing is not to be late with the reverse maneuver, otherwise, the plane will collide with the mountain and have to start again. A little while later, anti-aircraft installations will begin to be located on the tops of the mountains. Above them, you can see a translucent dome, inside of which it is better not to fly. This is the radius of a defeat of the anti-aircraft installation and, once in it, it will no longer be possible to get out. Only two elements are responsible for management: a multi-position stick in the left corner of the screen and a virtual bomb drop button. The latter, by the way, takes a little time to recharge, so do not count on a high rate of fire. But in the amount of ammunition and in time, we are absolutely not limited. Progress in the game is saved, so do not worry about trivial defeats, after restarting you will find yourself in the same location as you were. Bomber Ace – this is a great time eater for Android , in which you should not pay attention to the graphics, as its feature in physics, voice acting and control. The game is distributed free of charge and does not require investments. It was not without advertising, but it does not appear in the battles themselves. Step 4. Now type Bomber ace in the search bar. After the search, click “Install” to continue and finish.